Typically when I receive a magazine, I read it, tear out what I want to keep in my design binder, and then give it to a friend (or to my recycle bin). But, I haven't torn a single page out of my collector's edition of Gourmet's Paris on a Budget. Now that's a treasure worth holding on to for several years. If you are considering a budget trip to Paris in the next few years, it wouldn't be a bad idea to have one of these babies on hand. 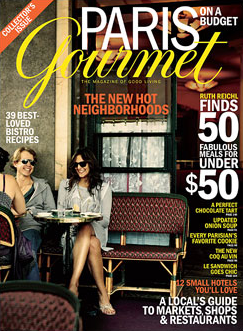 You can call Gourmet at 1-800-365-2454 to order the "Paris on a Budget" issue...it'll cost you about $9. I would love to have a copy of this magazine. However, it looks like it is out of publication now. Perhaps I will head to the library to check it out! It only took one post to know I wanted to follow your blog! If you find out a way to get this magazine, I would love to have a copy. I would love to have a copy of this magazine! What month is it? I tried looking for it wasn't able to find it. Sorry, I got so excited I didn't even finish reading to find out you have to call them and order it! Thanks again for this great information. Ha ha! I loved this special issue just as much! Gosh that could even be handy for us folk who actually live in the city of light ... thanks for the tip.